NEW!! Round 2 of Snowball Fight '99! Hit everyone!! So you've been sitting by the fire getting warm, right? Sipping some hot chocolate and recovering since the last snowball fight? Well, surprise! Round 2 is on!!! 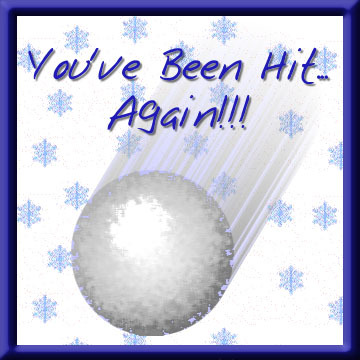 You've just been hit by another ICQ snowball! Your skills have been perfected since the last fight, so now you're more ready then ever! It's just like those snowball fights you had as a kid, but digital style! Don't just sit there with melting snow dripping down your face! Throw a snowball back at the person that sent you this page and at all your other ICQ friends!